Atlanpole Biotherapies, Competitive Cluster of the Pays de Loire region, organized a conference dedicated to Antibodies on December 11th 2012 at the Chamber of Trade & Industry. 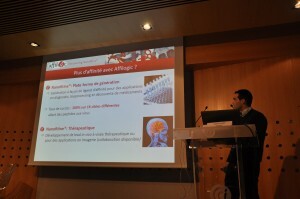 Mathieu Cinier, R&D project manager at Affilogic, addressed a panel of researchers from the region’s biotech companies and academic labs, presenting the features of Nanofitines and their competitive advantages over antibodies in a wide range of diagnostic and therapeutic applications. “Affilogic is one of the companies that will go to Canada with a delegation from Atlanpole and District of Creation from 25th November to 2nd December. Because Affilogic is talented for Export. FP7-supported project SADEL (Scaffolds for Alternative DELivery) officially started on Jan 1st. This project involves 7 partners with Affilogic and aims at developing oral formulations of Nanofitins® for treatment of Inflammatory Bowel Diseases.